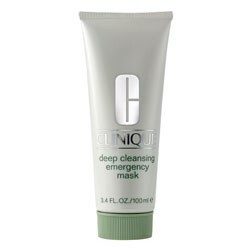 Clay-based treatment for oily, pore-clogged, skin-under-stress. Aqua, Kaolin, Butylene glycol, Sodium lauroyl sarcosinate, Corn starch modified, Cyclodextrin, Salicylic acid, Kola (cola acuminata) nut extract, Aloe (aloe barbadensis), Rosemary (rosmarinus officinalis) extract, Modified heteropolysaccharides, Menthol, Xanthan gum, Sodium magnesium silicate, Disodium edta, Phenoxyethanol, Imidazolidinyl urea, Methylparaben, Titanium dioxide (cl 77891). I loved this mask! It is fabulous at really getting into your skin and cleansing it really deeply; I believe my face really appreciated this mask because it felt refreshing and made my skin feel gorgeously soft and smooth. I also believe this reduced my pore size a lot, which is fantastic! There aren't really many weak points to this, but, if you have sensitive skin, which I don't therefore I don't find this an issue, when this mask is working its magic, instead of tingling slightly like it does on other skintypes, it may tingle a little more than you expect. The only reason I know this is because i applied this mask with a friend who has extremely sensitive skin, she was quite surprised at the amaount it was tingling for her in comparison to what I felt, which was just a relaxing tickling sensation. However, she didn't find this a problem after she got used to it, so I don't think you will either. I would highly recommend this to anyone who wants to take care of their skin and give it a beautiful soft, suppleness and radiant glow. Enjoy using this maximum effect mask!